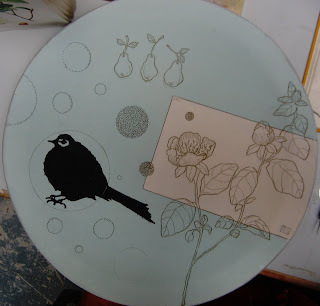 Yesterday I worked on this large 18" platter for a special order and I thought it would be fun to chronicle the drawing and etching as it progressed and share it with you. 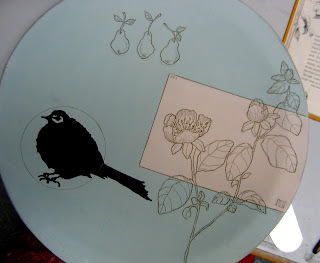 1. the platter is hand painted first with the main color elements in place. (note; book illustration for reference and cup of tea for encouragement). 2. I draw the design in pencil first (you might have to look closely to see the pencil markings). 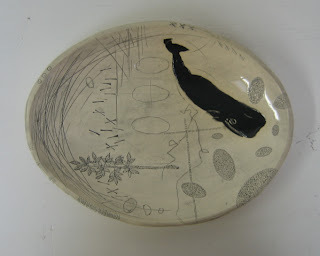 The pencil markings burn out in the firing. 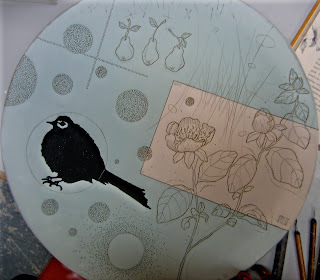 3. the first etch. 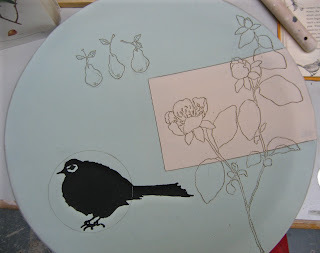 just the basic lines of the motif are etched in. 4. starting to add the detail. notice the name stamp (on the right hand corner of the ivory rectangle has been added as well). 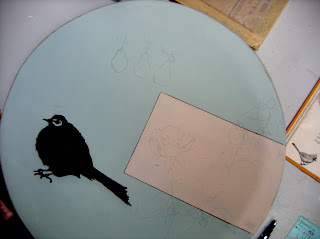 5.Let the circles begin! The long and tedious process of hand stippling the circles. I've drawn so many circles that I don't need a template to draw them anymore. They are all free hand. Practice makes perfect! I will be back soon to show you some magic! 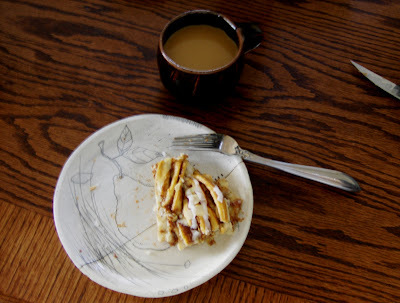 Today I received the most lovely email with a photo of one of my plates with a tantalizing piece of pie atop it. It inspired me to share some of the photos other people have taken of my pieces once they have become their own. This is the one I got today from Tim. Pie on my pear plate. Yum! And Amisha, you're killing me with the cupcakes. Boy this makes me smile. I call them tea bowls but Martha uses hers for yogurt. Okay, I am hungry now. I really love being a part of peoples lives in this way. 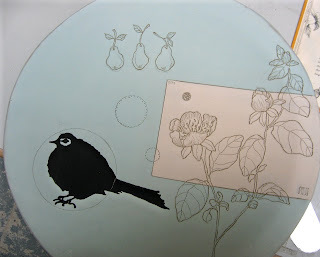 I wanted to let you know that these two platters are now available in my shop. okay, now back to work!! I had a recent house (& studio) guest stay with me this past week. I thought it would be fun to mix it up with the photographs and add a new "live" element and Wilfredo kindly obliged. He even dawned his lovely stripey sweater for the photo shoot. 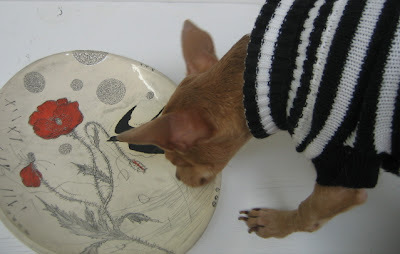 I do think he might of been bit disappointed that the above platter was not filled with doggy kibble. 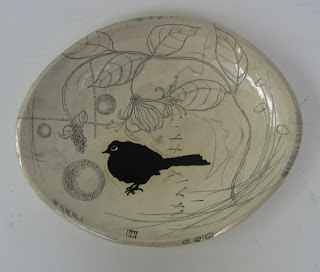 The platter along with many other new items will be going off Swallow Gallery in Brooklyn.